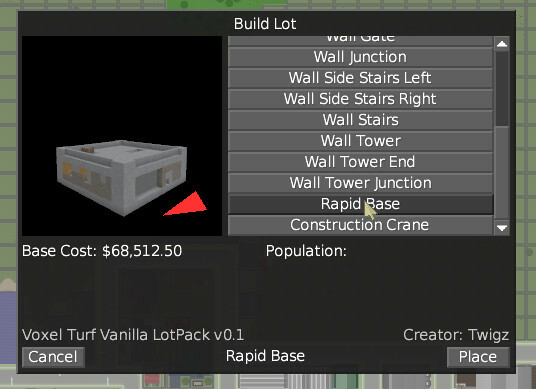 Bases in Voxel Turf are very important. They let you heal, respawn, garrison defenders and more importantly project power throughout the city. Today's Dev Diary is all about bases and base building mechanics! Above: player base. 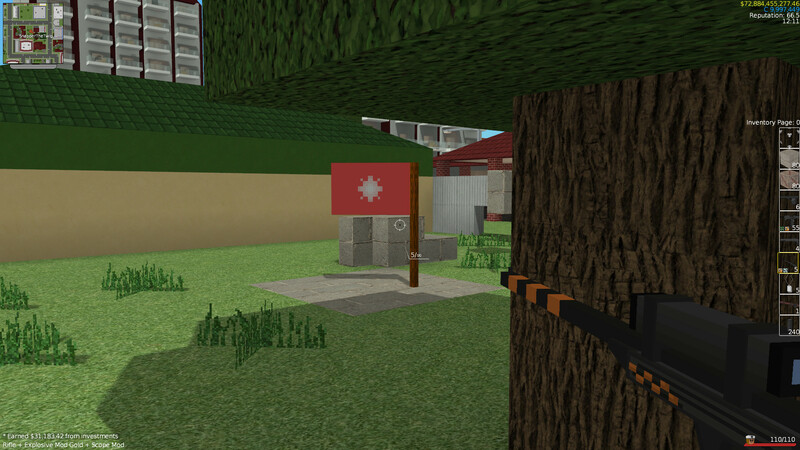 The flag is your spawn point in the base and can be moved around. Gives LIMITED IMMUNITY to some crimes when nearby! They also have side benefits – an chest placed in a base will be “locked” from other players, protecting your items from theft. Be careful though, if your base is captured by another player any chests in the base can be looted. To "not be in combat" you have to be in a friendly base for 3 seconds and have not fired a weapon nor taken damage for at least 12 seconds. Vehicles you are in also heal at the same rate. Bases have a radius that extends 8 lots away from the base. Merged lots are also included in the range. Within this range you can place roads and buildings, zone land and protection racketeer buildings for income. 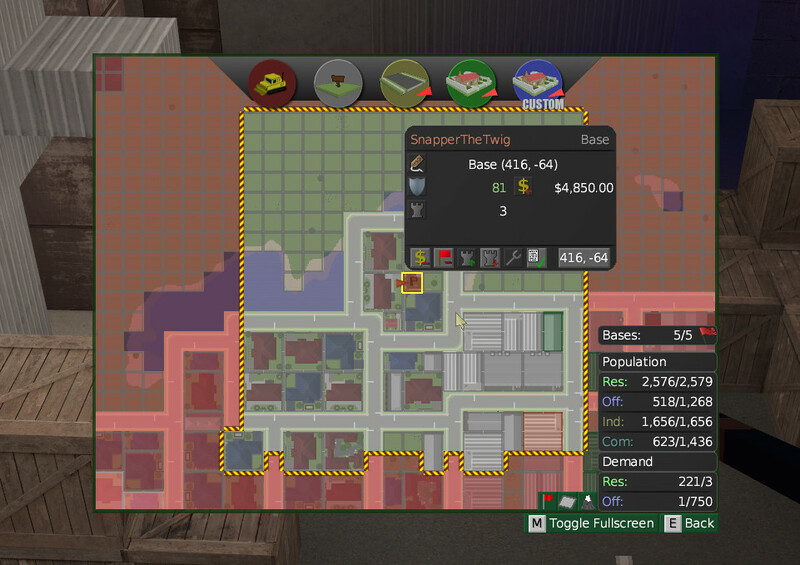 Above: player base range is 8 lots. Merged lots are also included even if they cross the boundry. You can hire goons to defend your base! 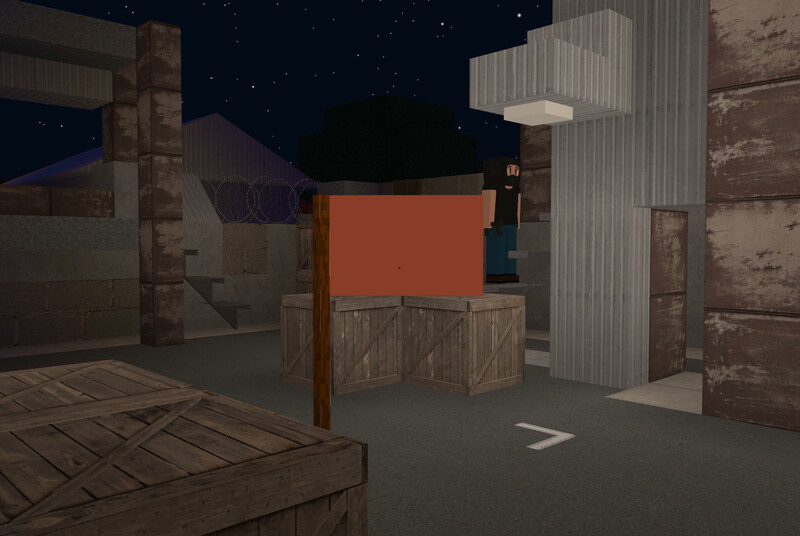 They will fire upon any hostile player who tries to take your base, and will also fire at any CDF Vehicles or Officers who are trying to arrest you. However, they are very expensive to have ($1200/min for 1, $2850 for 2, $4850 for 3). Empty base. 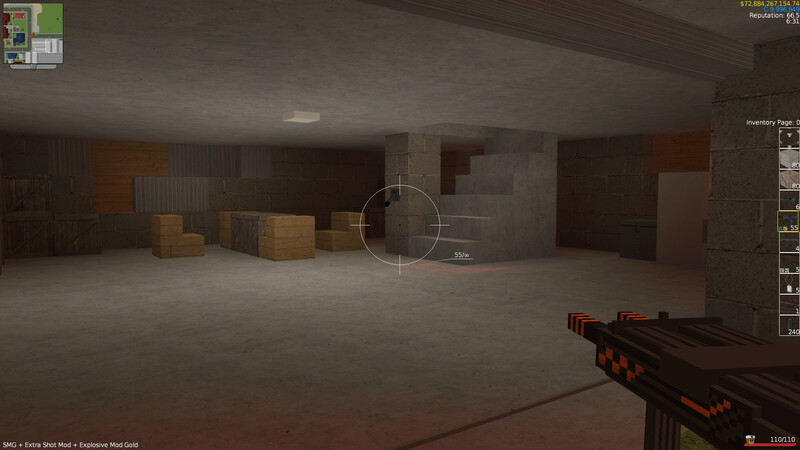 This gives your defenders an unobstructed line of fire against enemies, but your enemies can easily charge right in. Barbed wire traps. In this video they are used to help slow the advance of invaders. Drawbridge + Pit. This on is fun! Make a draw bridge, and if any nasties come flip the lever! 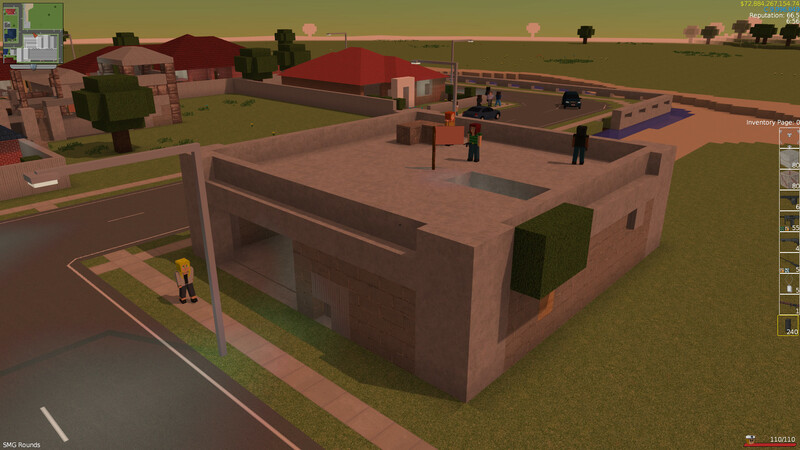 Rapid Base – The game comes with placeable walls and towers. It also comes with a “Rapid Base” lot than can be smacked down for about $40,000. This has garage doors, some chests to store things and a rooftop that you can access via a central staircase. Above: selecting the Rapid Base. Also note you can place walls and towers! Above: a rapid base with a couple of hired goons! You are limited to how many bases you have – this is to prevent players from becoming effectively immune from attack via shear base spam. As you acquire wealth and power you will however need to expand. Don't despair as you can unlock new bases by increasing your investment profit. You unlock your third base at $1,000 profit, your fourth at $4,000 profit, third at $9,000 etc. After 10 bases unlocked you unlock a base every $50,000 profit increment. You can take a perk called “Wide Focus” to give you 2 bonus bases. The formula for base limit is moddable in bases.lua. If a player loses all of their bases they are "eliminated". This is similar to "annexation" in a Grand Strat game or elimination in a RTS. You'll lose all of your buildings (even if fully owned), all of your owned, occupied or racketeered lots, and all of your money and credits. Oh, and your reputation is SET to -25 for good measure too. But don't despair, it isn't the end! You also still keep your level-ups and perks so its really quick to swing back. Mission giving NPCs will forget who you are! This means early missions will become available again, allowing you to re-snowball power. I should reiterate and emphasise that an elimination is not the end – in test games I've gone on to conquer the city after being eliminated. Bases tend to get beaten up in Turf Wars. You can always repair them by hitting the Repair button, and using the Insure button to save the current state. 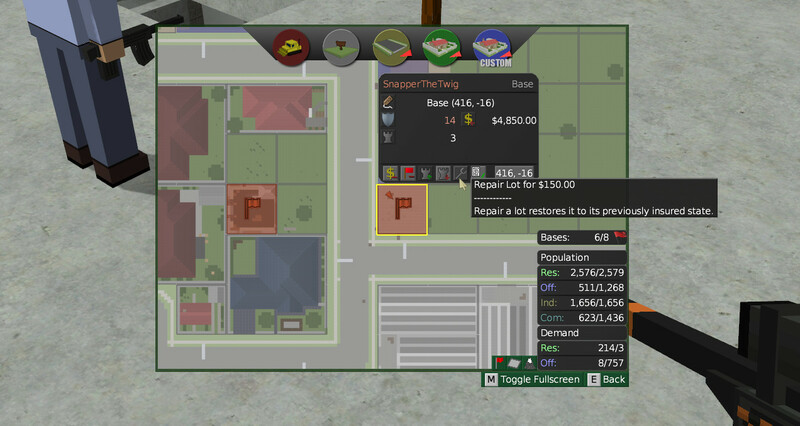 For more detail, see the "Insurance and Repair" sections of this dev diary. Every Turf map has one of these, this is where you appear when you first join the map. This acts like a base but for ALL players. 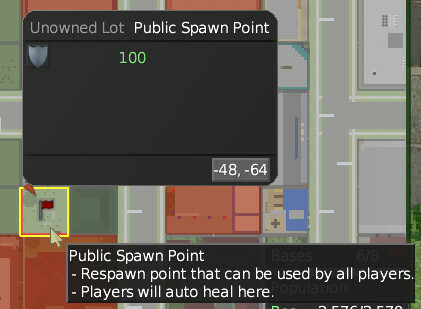 Everyone can heal here and everyone can respawn here! If you're making a multiplayer FPS map then you can place several of these around for players to use!